Addiction is a choice – ..:: Justgo4it! ::..
CURACAO – Henk Kempers (50) dealt with drugs in an early stage of life. With help from above, he came free from a heroin addiction that had lasted for years. Right now he provides help for the addicted in Soto. His next step will be to raise awareness for these problems, through the foundation JustGo4It. Today we have the first of two parts of an interview. ‘A year later, I heard voices in my head because of all the drugs. Those voices made me do what I did: using drugs, scamming people, robbing, manipulating, anything. Just anything to get drugs. I created my own world and those voices became my own reality. The evangelists convinced me to pray with them. Kempers stepped into a car with the people that had approached him. What came next, looked like a scene from The Exorcist. In the months after that he told about his faith to several addicted and homeless people, and gave them a roof over their head. A few dozens of people had the same experience as Kempers and changed their lifestyles. In Soto he has a little office now in the Sentro di Bario, where he battles against addictions. He prefers to visit his clients. ‘I help in the field, not in an office. So I sit under a tree, play some chess with these people and I ask questions. You get them to think that way. Yes, it works. I just don’t believe that I can think for someone else. I can’t get to know you if I give all the answers, so I ask questions. ‘I speak Papiamento’, explains Kempers. ‘But not as good as I should. By chance, the people that I’ve been helping, have lived in the Netherlands for a long time, so that’s good. On the other hand, it’s also a disadvantage because now I don’t speak their language so well. Does he treat ‘all’ addictions? ‘Mechanism of addiction is always the same, but I don’t always treat the people myself. Let’s say someone’s addiction is food, then I’ll send this person to a friend of mine. He’s a dietician. My core business is drugs and alcohol, and unfortunately, there’s more than enough of that. 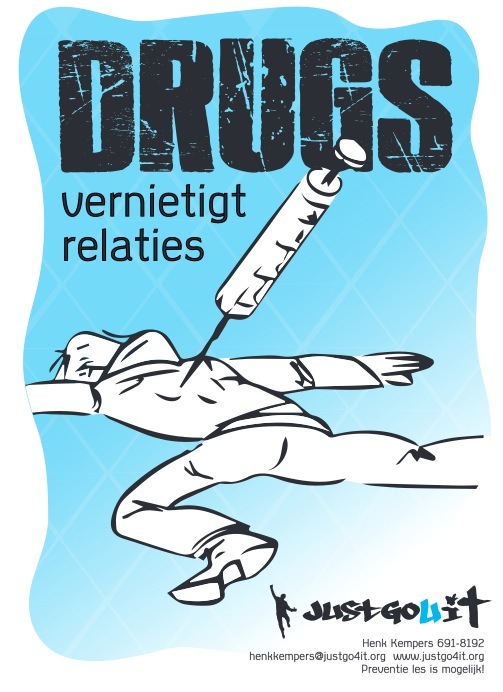 CURACAO – Henk Kempers (50) dealt with drugs in an early stage of life. With help from above, he came free from a heroin addiction that had lasted for years. Right now he provides help for the addicted in Soto. His next step will be to raise awareness for these problems, through the foundation JustGo4It. Right now, the last of two parts of the interview. Kempers provides for addiction care in Soto. In his battle against addiction he uses, among other things, his social skills and his faith. The results are amazing. ‘Someone came up to me who was directed to us by a social worker. He actually didn’t really like Dutch people, but well, he was directed to us. We started praying with him, and the exact same thing that had happened to me when the demons left me (see part one of this interview), it happened to him. Since then he doesn’t use coke any longer. He couldn’t work because his back was damaged. When we asked Jesus if He could heal it, it happened. That’s three years ago and we became friends. I’ve never been the professional that would help him. Do people have to be believers before he helps them? Kempers: ‘They need to believe that they have a problem, yeah, but they don’t necessarily have to believe in God. If they understand that they have a problem, then you can help them. Otherwise you’ll spend much time, but eventually they do as they please. ‘No one is helped with that’, according to Kempers. ‘Addiction is never the problem. Addiction eases the problem so you won’t think of the pain. No one wants that en everyone has his own story. In rehab they break you down, but you get nothing in return. It’s just detoxification. But then it’s just getting started, because that’s when the emotions come. The social worker understands why so many medication is prescribed. Kempers: ‘Pharmaceutic industry grows when as many products as possible are distributed. Millions are made, especially by the ‘double-troubles’ (people that are addicted as well as psychiatrically ill). They just wander around on the streets, can’t be treated, they are drugged. They can’t even talk anymore. Many medication is prescribed, but few things are treated. Because of all the medications, all emotions are nearly driven out so there’ll be not much left to treat. So you give up in bringing those people to a process free of addiction. Besides prevention, JustGo4It has more plans for the future. ‘We’re in a process to buy a piece of land, so we can build houses for families to live free of addiction. The problem is that often on this island, there’s not just one family living in a house, but two, or three sometimes. Because of that, everyone gets involved in education. In those cases it can be good to get someone out of his environment. Family can have a bad influence. I tell him that this last saying is hard in a family culture like the one of Curacao. Kempers doesn’t mean to be rude, he just wants to show the link between the addicted person and his surroundings. ‘You see, if someone is addicted, it has consequences for the whole family. That’s why I focus my work in Soto on families. So I also work with the spouse, if he or she is there, and with the kids, so there’ll be a change in the family of any kind. Kemper’s most important message is not a religious one: ‘Addiction is not an illness, it’s a choice. You are there yourself. You can’t say that in the Netherlands, they’ll say that addiction is something that happened to you. Addicted people were given pills, methadone, or, if they looked really sad, some coke. That’s why their problems didn’t end. Rates of crime didn’t descend, if it only were true. Research has shown it. Addiction care is messing things up. Kempers emphasizes making decisions, just like the British writer Theodore Dalrymple in his book ‘Life at the bottom’. But besides choices, aren’t there other risks that influence people in making decisions? ‘That’s a good question. Do you mean that there are thoughtful and thoughtless decisions? So, drinking five glasses of beer happens without you being there? Most people know this, but they don’t want to see it because it’s just nice. You can’t say afterwards that it just happened to you. When something is exciting, are you still aware of what you’re doing? I think you are. Mankind loves excitement, but doesn’t want to bear the consequences. For more information, you can call us: 6918192. Or email: henkkempers@justgo4it.org. On our website, www.justgo4it.org you can find more information about the foundation itself.